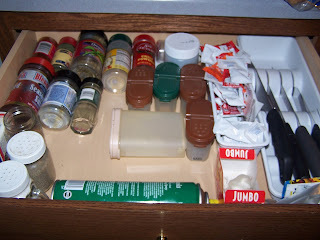 I first wrote about my spice drawer way back in 2007. The drawer is much fuller now. But I still love having all the herbs in the drawer next to the stove. I have my knives in there, also. So convenient when I’m cooking. My baking spices are in a cabinet on the other side of the kitchen. So I guess, technically, the drawer is an herb drawer as it holds all the cooking herbs and such. Having my herbs in a drawer still Works for Me! To see more Works For Me Wednesday ideas, visit We are That Family.